1. Worn-out palm: A worn-out palm is the most common wear pattern. 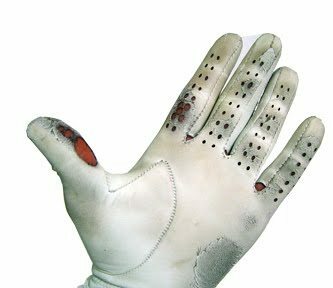 It's caused when I hold the club in my palm instead of beneath the heel pad of the thumb and fingers. When I do this it leads to a slice or a lack of distance. 2. Thumb tear: A thumb tear is usually caused by one of two things. That is either poor thumb placement or incorrect pressure between the thumb and club, resulting in a loss of control. 3. Index finger wear: An index-finger wear pattern indicates a poor connection between my hands. When I use an overlapping grip, my right hand's pinkie finger digs into my left hand's knuckle. My glove is key good golfing in Thailand. Using new gloves and rotating them thought the round helps allot. Using a good grip also helps my swing and score. I monitor the wear patterns on my glove and make adjustments to for longer straighter shots. Try the same and I bet you will improve your score and have more enjoyment golfing in Thailand.